What is a dewatering tube? Specialty textiles fabricated into large bags or tubes for the containment of materials (generally sand) to form engineering structures in marine environments. They were developed in the USA in the late 1980's. The technology has developed such that these systems are a well accepted engineering methodology that provides a unique and cost-effective solution to engineering problems in a marine environment. In more recent times the use of such products has been extended to include the effective dewatering of sludge from a range of industrial processes. The use of such products provides a very innovative, efficient and economical alternative to the dewatering of sludge over more traditional methods. CONTAINING the fine-grained material to be dewatered within the unique weave of the ProTube textile. DEWATERING of the excess water through the specially constructed high flow pores of the ProTube textile. There is significant volume reduction of the material in this stage which allows for repeated filling of the ProTube product in many cases. 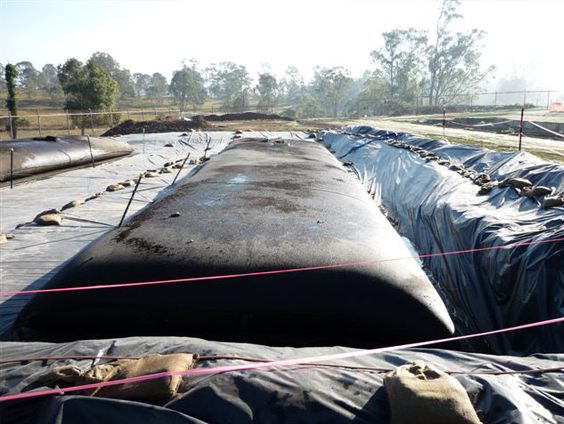 CONSOLIDATION of the fines occurring after the final cycle of filling and dewatering. The fine-grained solids contained within the ProTube product continue to consolidate through desiccation with residual water vapour continuing to escape through the unique pore structure of the ProTube product. This results in the most effective state for final disposal of the waste.